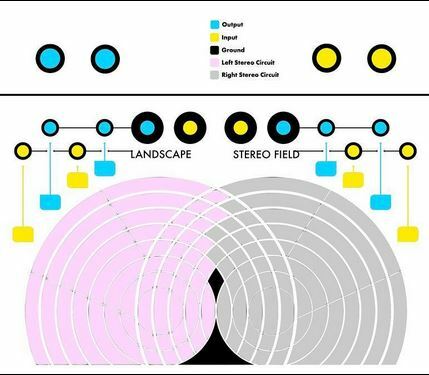 STEREO FIELD is one instrument with three uses. It is simultaneously a stereo/quad modular touch plate synthesizer, a stereo/quad audio processor and a pressure sensitive chaotic CV controller. All three uses are available separately as well as simultaneously and in conversation with each other. The Stereo Field allows its user to manipulate and patch two analog stereo circuits via touch plates. By utilizing skin conductivity as new paths for current to follow you are creating new circuits and new sounds in relation to where your fingers are patching. 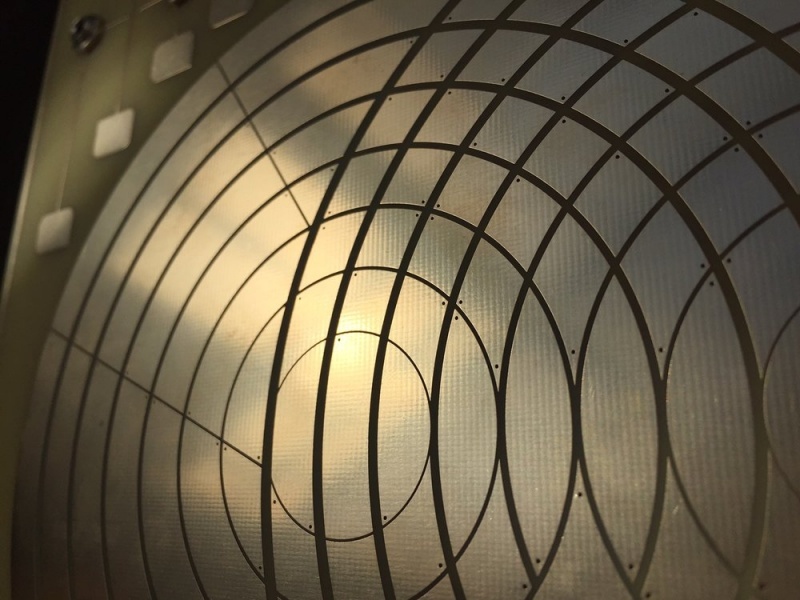 The individual touch plates are directly connected to nearly every connection point of every component in its circuitry (located directly under each corresponding touch plate). 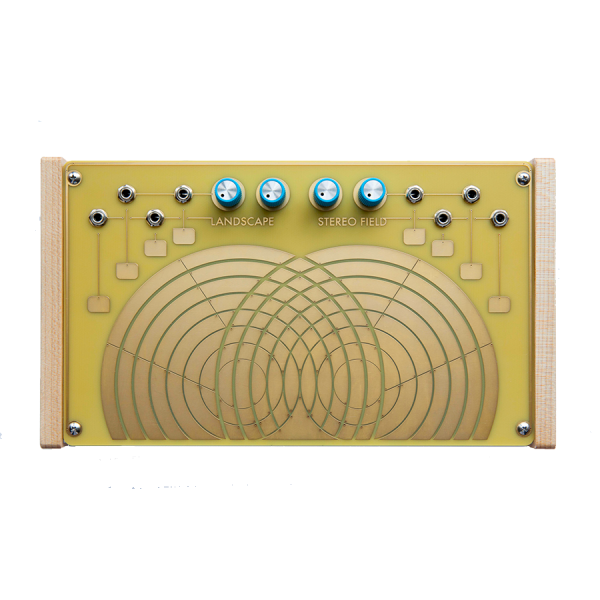 When touched it will create analog synthesized audio with either of the two mirrored circuits represented by interlocking touch-plate circles. These parallel mirrored circuits can be finger patched separately or together yielding vastly different results in regards to texture, timbre and stereo imaging. This instrument has the ability to create atonal synth tones in stereo (and quad) as well as process incoming stereo audio (and quad) sources via 1/4" and 3.5mm ins and outs. Incoming audio sources can be "patched" or rewoven into any area of either or both of the circuits via skin contact. The two stereo input volume knobs (center) shape and effect distortion, drive amounts, internal feedback pitch, and modulation rates depending on how your fingers are patching. The quad inputs and outputs via the 3.5mm jacks have small touch plates leading to and from allowing for touch access of each of the 4 inputs and 4 outputs. If multiple audio signals are traveling into the Stereo Field these audio sources can be intermingled and can modulate one another, again depending upon where your fingers are patching. Sending CV signals into the 3.5mm input jacks will open up many more possibilities both in terms of synthesized sounds and audio processing. The Stereo Field can also be used as a controlled chaos source when using the 3.5mm outputs to send CV to your modular system. Due to the nature of feedback and finger patching the 4 available CV signals have the ability to get incredibly complex and textured in nature (see audio examples below in use with a euro-rack system). Because of the open nature of Stereo Field it can both send and receive CV modulation simultaneously. In addition, this can all be happening while your finger patching is changing and altering the incoming and outgoing CV while also processing incoming audio. These ins and outs can also be patched together with cables for sustained tones with the pitch/rhythm/volume/"cutoff" being affected by adjusting the incoming and outgoing volume knobs in various settings. Inter-patching in this way will also allow for sustained pulse beats and filter-esk sound shaping in addition to bringing new results to finger patching via the touch plates. Most importantly, processed audio and synthesized audio are available simultaneously with the ability to influence and modulate each other. This will often blur the lines between the two; who is manipulating who? who comes out on top as audio and who is modulation? This can be a constantly evolving cycle based upon where the performers fingers are placed and highly sensitive skin contact pressure changes. There is a type of collaboration that happens with the Stere Field as sometimes you will be reacting to what it is doing and other times you will be attempting to control and shape what it is doing but most of the time you will be doing both simultaneously.